Laelia x eyermaniana Rchb. 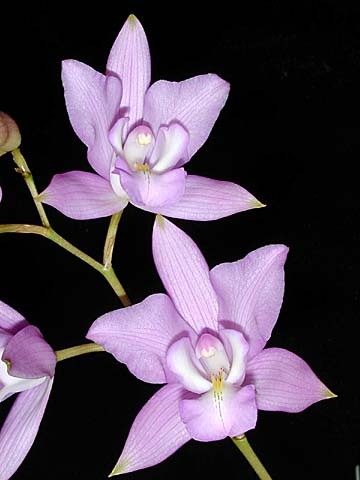 f. 1888 Photo courtesy of Andy's Orchids Copyright © 2002 All rights reserved. Flowering plant in situ in Mexico Photo by Robert Weyman Bussey. This natural hybrid between Laelia speciosa and Laelia albida is a small sized, cool growing epiphyte or lithophyte with conical-ovoid to subglobose pseudobulbs enveloped basally in youth by imbricating, scarious sheaths with 2 to 3 apical, lanceolate-elliptic, or oblong-lanceolate, acute to subacute, basally clasping leaves that blooms only in summer and early fall on a apical, 12" to 3.5' [30 to 100 cm] long, erect-arcuate raceme arising on a mature pseudobulb with 3 to 12 showy, fragrant flowers. 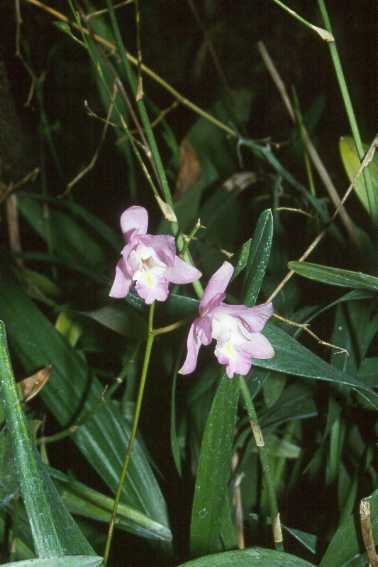 Plants are smaller than Laelia autumnalis and it comes only from the Mexican west coast north of Oaxaca state into Nayarit. Durango Mx., 2438m elev., near Puerta de los Membrellos, epiphytic on oaks, sometimes lithophytic beneath trees , growing in the same tree with Laelia albida and Laelia speciosa at altitudes between 1050 and 2500 meters.